Air-driven vanes as a part of the arming device of the bomb. As the bomb falls, the vanes rotate, and the bomb gets armed as soon as the vanes have rotated the requisite number of times. 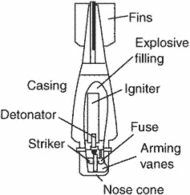 Arming vanes are normally in the nose portion of the bomb but also may be part of the tail unit of the bomb.